Sapphire Buffalo Grass has all the benefits of the other high performance soft leaf Buffalo grass, such as: needing less water, deep roots, greener in Winter, a good sun or shade turf and it’s hard wearing. However, Sapphire Buffalo Grass has the added benefit of a finer texture. 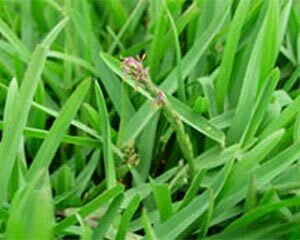 Sapphire Buffalo Grass does not rely on fine leaves for its fine texture, but its folding leaf. When Sapphire Buffalo Grass is mature, its leaf folds at tight angles along its axis, resulting in a fine texture. This is important, because fine leaf Buffalo lawns usually have thatch problems, are shallow rooted, poor wearing and are slow growing. A Sapphire Buffalo Grass lawn does not suffer from these problems. Not only is a Sapphire Buffalo Grass lawn hard wearing, due to its quick recovery from wear damage, but it is also shade tolerant like all other good varieties of Buffalo grass. It is an easy grass to grow. What makes a Sapphire Buffalo lawn different to other Buffalo lawn varieties is its fine texture. Until now, fine textured Buffalo lawns have been slow growing, and shallow rooted, but a Sapphire Buffalo lawn is different. We believe it is the only fine textured, quick recovering Buffalo grass in the world. A Sapphire Buffalo lawn also has excellent disease tolerance and a great Winter colour. Pests – watch for the Lawn Grub (e.g. Web Worm or Army Worm) and African Black Beetle – apply suitable pesticides according to directions. Weeds – if weeds infest, hand eradicate before seed head develops or apply a suitable weedicide (ask your local garden centre). NB: sprays containing DICAMBA must not be applied to soft leaf Buffalo grass!!!!!! !